NICOLE KIDMAN as Virginia Woolf, JULIANNE MOORE as Laura Brown, MERYL STREEP as Clarissa Vaughan, ED HARRIS as Richard Brown, TONI COLLETTE as Kitty, CLAIRE DANES as Julia Vaughan, JEFF DANIELS as Louis Waters, STEPHEN DILLANE as Leonard Woolf, ALLISON JANNEY as Sally Lester, JOHN C. REILLY as Dan Brown, MIRANDA RICHARDSON as Vanessa Bell, JACK ROVELLO as Richie, EILEEN ATKINS as Barbara, CHARLEY RAMM as Julian Bell. The Hours is the story of three women searching for more potent, meaningful lives. 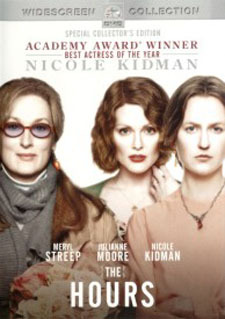 Based on Michael Cunningham’s 1999 Pulitzer Prize winning novel, the film interweaves the stories of three women – a book editor in New York (Meryl Streep), a young mother in California (Julianne Moore) and author Virginia Woolf (Nicole Kidman). Their stories intertwine, and finally come together in a surprising, transcendent moment of shared recognition. Presented by PARAMOUNT PICTURES and MIRAMAX FILMS. Produced by SCOTT RUDIN, ROBERT FOX. Costume Design by ANN ROTH. Production Design by MARIA DJURKOVIC. Director of Photography: SEAMUS MCGARVEY. Based Upon the Novel by MICHAEL CUNNINGHAM.